Academy Award-winning actress Meryl Streep said in a new interview that it is "kind of great" that one day the American people will have to thank President Donald Trump and disgraced Hollywood producer Harvey Weinstein for the current turmoil in politics and Hollywood. The Telegraph asked Streep about the #MeToo movement in an interview published Friday. "It's sort of like, something that felt like its time had come," Streep said of the fallout in the political world and entertainment industry over the recent waves of sexual harassment allegations. "And in a way we're all going to have to thank Donald Trump for securing the executive branch of our government. We're going to find where all the weaknesses are in our government. And we're going to have to thank Harvey Weinstein for a moment in time where the door just got blown open. And it's kind of great." "It's kind of great that it's happened. It's horrible for the people that were sacrificed along the way," she continued. "But it's almost like they went to war, these girls who stood up. And they took the bullets." The #MeToo movement erupted on social media after both the New York Times and the New Yorker published explosive reports back in October about multiple women who accused Weinstein of sexual harassment and assault over a period of nearly three decades. In addition to Weinstein, dozens of politicians, media figures, and Hollywood celebrities have faced allegations of sexual misconduct. Streep did an interview with the New York Times earlier this week in which she was asked about her silence following the Weinstein allegations. Streep acknowledged that Weinstein was "deeply evil" and "duplicitous," but she also appeared to justify her silence, saying that she did not have Twitter or Facebook to amplify her views on Weinstein. She added that he was a "champion of really great work." The Times followed up by asking Streep what she thought of people waiting for her to speak on Weinstein. "I don't want to hear about the silence of me. I want to hear about the silence of Melania Trump. I want to hear from her. She has so much that's valuable to say. And so does Ivanka. 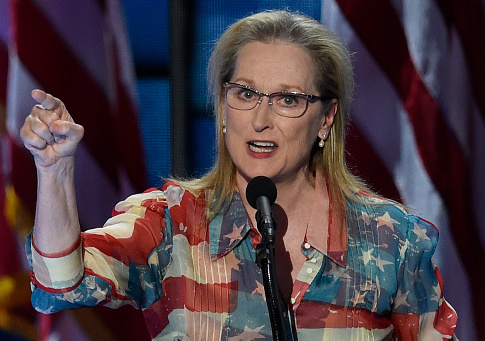 I want her to speak now," Streep responded. This entry was posted in Issues and tagged Donald Trump, Harvey Weinstein, Meryl Streep, Sexual Harassment. Bookmark the permalink.